(Nanowerk News) Israeli scientists from the Technion-Israel Institute of Technology and the Weizmann Institute of Science recently combined one group’s expertise in tissue engineering with the other’s expertise in the physics of complex systems to understand in detail how mechanical forces can direct the orientation of developing blood vessels. Their findings, which were published in the scientific journal Nano Letters("Tissue-Level Mechanosensitivity: Predicting and Controlling the Orientation of 3D Vascular Networks"), may advance methods of growing artificial tissue for transplant. Cells, whether in the body or in lab-grown tissue, constantly interact with the extracellular matrix (ECM) – a highly complex molecular network that provides structural support for cells. Until recently, scientists had assumed these interactions were primarily biochemical. Researchers have now realized that mechanical interactions – for example, the ability of cells to sense various properties of the ECM and respond in kind – also play significant roles in cell development and function. One of the scientific challenges to producing artificial biological tissues for transplant is that – like the real thing – they must contain a network of blood vessels to ensure a steady supply of oxygen and nutrients. Highly essential to the implant's integration and survival is the directional order of this network. In other words, the blood vessels must organize themselves in the same direction. In Prof. Levenberg's laboratory, a platform designed to improve tissue generation and self-organization for transplantation has been developed. The technology is based on three-dimensional scaffolds made of polymers. Biological cells that are essential for the development of blood vessels are seeded on these polymeric scaffolds; studies have proven this technology viable and robust. In 2016, Prof. Levenberg and Dr. Dekel Rosenfeld, then a doctoral student in her lab, showed how an original stretching system, which applied tensile forces to the artificial tissue, affected biological processes in the cells, including differentiation, shape, migration and organization in the structures – as well as the geometry of the emerging tissue, its maturity and stability. This earlier study also showed that tensile forces acting on the tissue during development promote the growth of blood vessels with well-defined directionality. In the new study, the researchers considered two types of stretching forces that can affect the development of blood vessels. These two, known as dynamic-cyclic stretching and static stretching, can lead to the emergence of directional order in vascular networks. The researchers discovered that the biophysical mechanism behind each of these two processes is fundamentally different. “One significant challenge we faced was to understand the relationship between the complicated biological experiments and the physical theory," says Mr. Moriel. 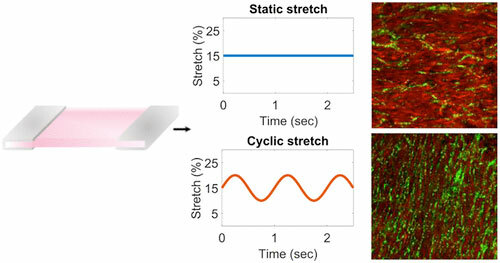 The study led to the establishment of a tensile stretching protocol - one that allows the controlled generation of optimal tissues, including stable, rich networks in which the blood vessels have a well-defined directional order.